Duke University is paying the U.S. $112.5 million to resolve allegations that it violated the False Claims Act by submitting falsified research data to win or keep federal grants. 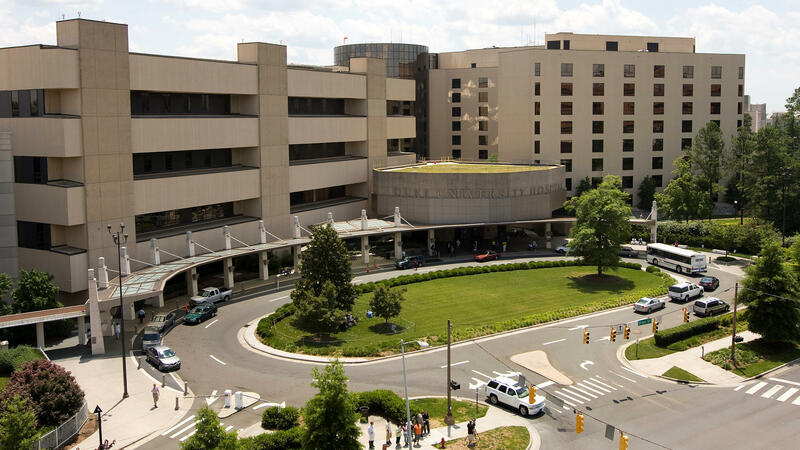 Here, a photo shows the Duke University Hospital in Durham, N.C., in 2008, when some of the fraud was alleged to have taken place. Duke says it "discovered the possible research misconduct in 2013 after the [research] technician was fired for embezzling money from the university." In a statement to NPR, Thomas' attorneys say his lawsuit was motivated by the fraud's scope, as well as his concerns that the university wasn't being transparent enough, after "Duke's administration and researchers faced the reality that seven years of data were false or unreliable." Discussing the university's ethical standards in a statement about the case, Duke President Vincent E. Price said virtually all of the school's researchers are dedicated to meeting them. "When individuals fail to uphold those standards," he added," and those who are aware of possible wrongdoing fail to report it, as happened in this case, we must accept responsibility, acknowledge that our processes for identifying and preventing misconduct did not work, and take steps to improve." In a letter to the university's community, Price said, "This is a difficult moment for Duke. Citing the "devastating impact of research fraud," he also said the school had taken numerous steps to encourage scientific integrity, improve training and archive research data. Because Thomas brought the original lawsuit under the False Claims Act's qui tam, or whistleblower, provisions, he stood to share in any money that was recovered from Duke. For pursuing the case on the U.S. government's behalf, he will now receive $33,750,000 from the settlement, the Justice Department said. Thomas' attorneys say he stuck with the case after the government opted not to mount its own investigation after he reported his allegations and filed suit. "In many meritorious cases, the government decides to 'intervene' at that stage of the proceedings, basically taking over the lead of the case," lawyers for Thomas said. "But here, that never happened. This left Mr. Thomas and his lawyers at the point of the spear – going against a venerated academic institution with enormous resources." Thomas' attorneys, from the law firms Gentry Locke; Healy Hafemann Magee & Thomas; and Brooks Pierce, said that in the fallout from the case, Joseph Thomas was "vilified and suffered substantial personal hardships as he found himself out of work for over a year." Thomas was working as a lab research analyst for Duke University Health Systems when, his lawsuit alleges, he learned that a researcher in the pulmonary division had violated the False Claims Act, defrauding the government of millions of dollars. In a lawsuit filed under seal in 2013, Thomas and his attorneys said that as the pulmonary division's former clinical research coordinator, Erin Potts-Kant was supposed to certify the validity of the unit's work and ensure that it fulfilled government requirements. But instead, the suit stated, "Potts-Kant engaged in systematic and near-universal research fraud," including, in some cases, making up data outright "in lieu of actually performing experiments." The suit also accused those who supervised Potts-Kant of ignoring signs of possible fraud or misconduct. Thomas' case against Duke on behalf of the U.S. government was tentatively settled last November. But the Department of Justice was slow to approve the deal, according to court documents. The settlement was officially announced Monday, after a hearing in the U.S. District Court for the Middle District of North Carolina in Greensboro. The case's litigation history includes nearly 300 motions, orders and other court filings.